Do grown-ups really dig this bubble stuff? From what we can tell, they can't get enough! 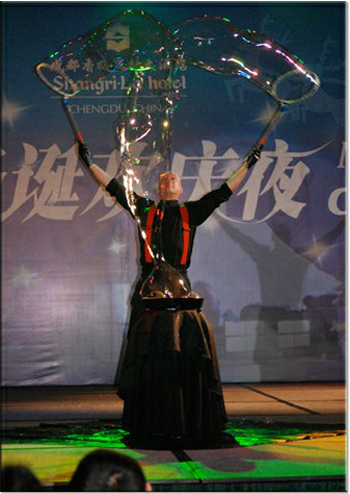 Mr. Carle will astound and amaze your guests with stunning and surprising manipulations of soap bubbles... with skills and showmanship that have taken him across the country and around the world. "Our client, Merck Pharmaceuticals, held a launch of a new asthma product. We thought a bubble artist with terrific breath control would be a great tie-in. Casey Carle went above and beyond our expectations by not only mesmerizing the audience with truly unbelievable skill but also by giving a room of sales reps a terrific jolt of creative energy related to the product... and hope to work with Mr. Carle again." "Carle covers the world of bubbles with real panache"
"Mr. Carle was a guest performer at an event under my direction for NewEgg.com, held at the prestigious Bellagio Hotel in Las Vegas. The audience included VIPs in the electronics field from around the globe. 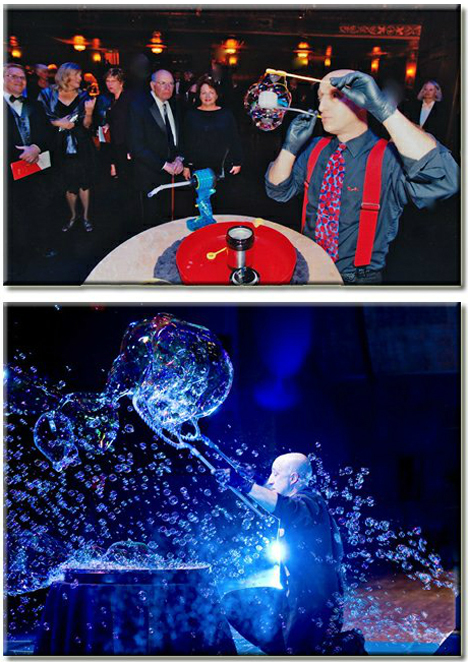 Mr. Carle's bubble act met with enthusiastic appreciation engaging the whole room with jaw-dropping skills that bordered on real magic... all done with class and style - a real pro - I do not hesitate to recommend him. Party on!" "It was a wonderful performance and it was a pleasure working with you. Your booking manager has been super for providing us with timely answers to the million questions that I have had and being so patient with me!" "Carle creates ephemeral masterpieces out of thin soap. Behind the act is a wealth of training and a passion for this slippery art form." to his own Big Band jazz music (formal show) or your party music (casual atmosphere). with minimal set up (for quick on and off) or something more extensive. WHAT DOES HE DO? Much, but not all, of what you see represented on this website can be presented in a style that is very appropriate for any age and any indoor setting. There are inherent limitations based on the size and type of venue, and the amount of designated space and time to work in. Rest assured, you will always receive an honest opinion as to whether Mr. Carle is a good fit for your event. [He is a very busy performer and takes only work he knows he can perform well.] Outdoor options including giant bubbling are available with certain limitations. IS IT MESSY? For him, a bit. For you, not a bit. Mr. Carle travels with his own custom made, marine grade, attractive tarp. Any mess is self-contained. No worries, even on dance floors. He is conscientious and courteous and there has never been an issue with this. WHY CASEY CARLE? Unlike some bubble manipulators in the entertainment field, Mr. Carle is first and foremost a consummate entertainer, meaning, among other things that he can adapt his persona and presentation to fit the dynamics of his audience. Mr. Carle did not discover bubble art then decide to make an act. Mr. Carle was a full-time entertainer/actor before mastering soap bubble skills. 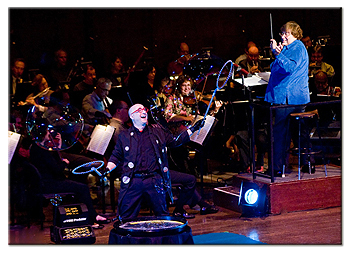 With more than 30 years of performing experience he is well versed in the techniques of engaging different ages and takes pride in an ability to "play the room". CAN HE ENGAGE GUESTS IN FUN SKILLS? Some casual events look to actively involve adults in exciting bubble skills. Mr. Carle has a repertoire of proven methods for doing just that....from teaching bare-handed bubbling, to blowing bubbles inside bubbles, to playing ping pong with fog filled bubbles(that burst into puffs of vapor), to allowing guests the opportunity to make the biggest bubbles in their lives, to placing people inside giant bubbles. And more. WHAT ARE THE FEES? There are many factors in deciding the fee, including but not limited to amount of performing time, number of travel hours or days, number of days at the event, etc. Fees are fair and come directly off a chart so they are not based on brand or company recognition. HOW DO WE BOOK HIM? Mr. Carle's Booking Manager will assist in the process as regards availability, fees, associated expenses, etc., as well as formally contracting the engagement. A retainer in the form of partial payment and/or a purchased airline ticket (when applicable) will solidify the date.